Participants at the San Fernando Future Stars Football Tournament, which took place at Skinner Park, San Fernando, recently. Photo coutesy San Fernando Sports Academy. 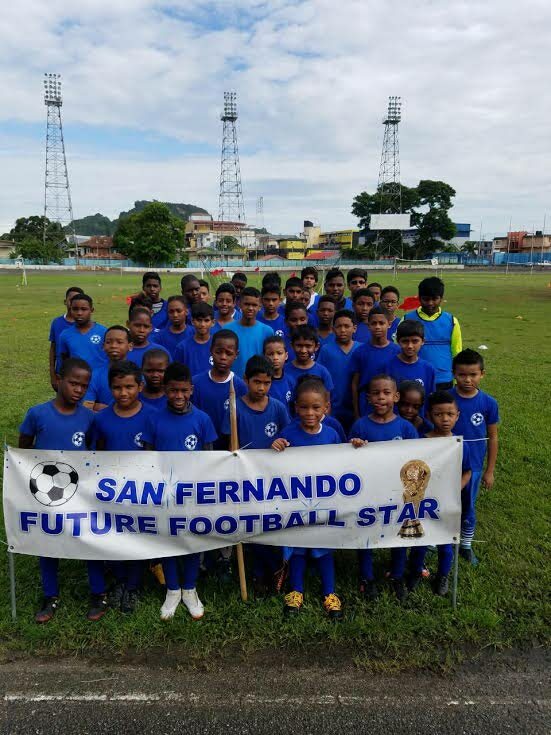 SOME 400 players representing 33 teams, some from as far as Tobago, were in action at the recent 21st San Fernando Future Stars Football Festival, hosted by the San Fernando Sports Academy, at Skinner Park, San Fernando. Age groups from Under-4 to Under-16 competed for trophies, medals and pride. Marabella Family Crisis captured the Under-16 crown for the second time, following a 2-0 win over Cox Coaching School. Kaymani Mohan finished as the leading goal scorer with 20, while Darel Garcia from Cox Coaching School emerged as the division's MVP. In the Under-14 division, East Mucurapo played through unbeaten en route to the title. St John Ballaz took second, followed by San Fernando Sports Academy in third. The Under-12 division was keenly contested. Cox Coaching School won Group A, while San Fernando Sports Academy took Group B. The two teams would then meet in the final, with both teams coming close to winning before settling for a draw and a penalty shoot-out. When the dust settled, Cox Coaching School won by a single kick from the penalty spot. Cox Coaching School then enjoyed further success, easing to the title in the Under-10 division. Jaric Titans of Tobago claimed second place and San Fernando Sports Academy took third. Jaric Titans made amends by taking the gold medals in the Under-8 division, with Cox Coaching School taking the silver, and the hosts claiming bronze. San Fernando Sports Academy captured their only bunch of gold medals in the Under-6 division. WASA FC Youth Academy and Fyzabad United FC placed runners-up and third, respectively. In the Under-4 division, which attracted players as young as three, Jaric Titans took top honours, while San Fernando Sports Academy finished second. Founder and technical director of San Fernando Sports Academy, Preston Nanan, described the tournament as a success. "It was a good day for development football in Trinidad and Tobago when children from ages three to 16 played and enjoyed a day of football," Nanan said. Nanan expressed gratitude to the San Fernando City Corporation, parents, coaches and technical staff members. Reply to "Youths shine at Future Stars Football Festival"